The Parliamentary Privileges Committee which convened yesterday has decided to file legal action against 7 Parliamentarians involved in the clashes in November within the house. Although cases will not be filed against the other 52 parliamentarians, who were also held accountable for the incident, the committee will duly decide on how to penalize them accordingly. 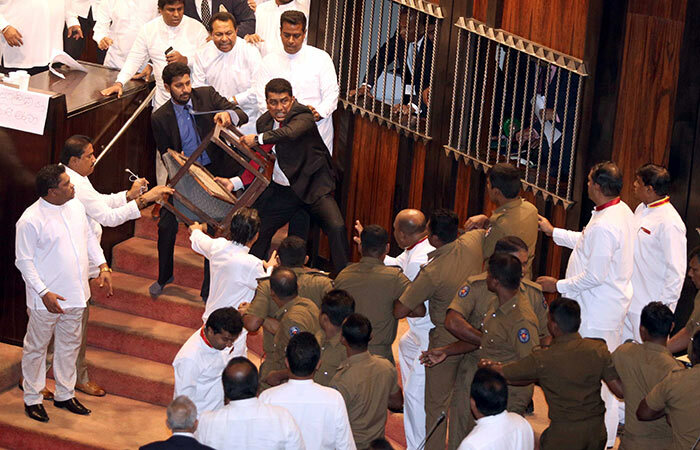 The committee appointed to look into the violent situations in parliament, which emerged during the sessions held on 14th, 15th and 16th of November 2018, had submitted its report to Speaker Karu Jayasuriya on January 22. The report compiled by the Committee appointed by the Speaker to investigate the clash had charged 54 UPFA MP’s, 4 UNP MP’s and 1 JVP MP. However, legal action will be filed against UPFA MP’s Prasanna Ranaweera, Johnston Fernando and Padma Udayashantha over obstructing Police duty, assaulting police officers and throwing chili powder at them. UNP MP Ranjan Ramanayaka and Deputy Minister Palitha Thevarapperuma will be charged for bringing in knives in to the house and for threatening. Good example for the people and young children in Sri Lanka. I have no words to describe the appalling behaviour of these thugs, Disgusting. Don’t blame them, we re the ones who voted them to parliament. All the fines imposed on the MP’s by Courts will be paid promptly by Makandure Madush and Aloysius. The fine will be paid not only by the persons you say but by TV stations who really feasted on the MP behaviours. The TV stations needs the performance of mongerel MP’s to earn profits.